Holding a twig in its claws, a beaver gnaws the bark with its sharp teeth. Beavers are one of the largest rodents on Earth. Beavers are known for their buck teeth and large, flat tail. These well-known features are what help the beaver live life from day to day. This animal, from the rodent family, has a thick brown fur coat and a soft grey undercoat that protects it from all climates. The beaver's tail is large and shaped like a paddle. It functions like a boat rudder, helping steer the beaver as it moves logs to its dam. The black scaly tail is also used for balance on land when carrying heavy tree branches. 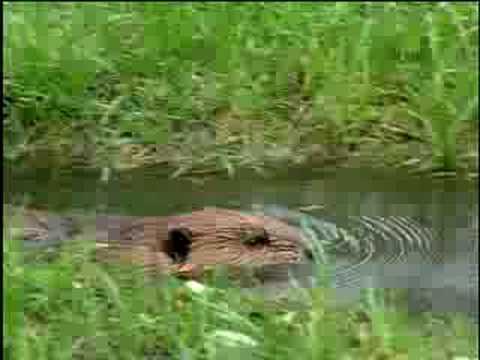 Beavers are excellent swimmers and are built for underwater work. They have valves in their ears and nose that close when they swim underwater. They also have a clear layer that covers their eyes when swimming, in order to protect them from anything floating in the water. Their front teeth stick out in front of their lips, so that they may cut and chew wood that is submerged underwater without getting water in their mouth. A beaver's teeth never stop growing and chewing on tree trunks and branches helps to keep the teeth from getting too long. They are strengthened with iron compounds. Some beavers can as much as 60 pounds! Beavers spend most of their time building dams and lodges — large cone-shaped pile of branches in the middle of a lake. They enter the lodge through an underwater entrance, which leads into a dry living area. As the colder months approach, they spread a think layer of mud on top of the lodge to keep out any predators, such as the lynx and wolf. If a beaver feels threatened, it will slap its tail on the surface of the water to warn other beavers in the area, then it will dive deep underwater to stay safe. Beavers are vegetarians and feed on non-woody-type plants — such as cattail shoots — during the spring and summer and then switch to eating shrubs and trees in the autumn and winter. They build canals along the ground to float sticks and twigs to their lodges for winter storage. A common belief about beavers is that they eat wood, when in fact it's only the bark they eat. Beavers build their houses from wood and sticks and mud. They are called beaver dams. They look like a big pile of sticks but they are emprty on the inside where they live. I saw this beaver walking in our yard. It was last week when it was raining and raining. We have some trees in our back yard but we don't have water so we cant figure out why the beaver was there. The first picture is the real beaver we saw in our yard. the second is a video from the internet. I remember last year there was a big dead beaver on the highweay in New Maryland. We saw it the day after his beaver dam was ripped apart. 4D4G, beavers are cute, but Project Noah doesn't allow users to post photos that they haven't taken themselves. So, pictures from the Internet aren't allowed.